Welcome To Red Carpet Smiles, Inc. Please Read: The FDA approves drugs. The FDA does not "approve" cosmetics. Teeth whitening is considered a cosmetic. There is no such thing as FDA approved gels for teeth whitening and anyone who advertises "FDA approved" is falsely advertising. 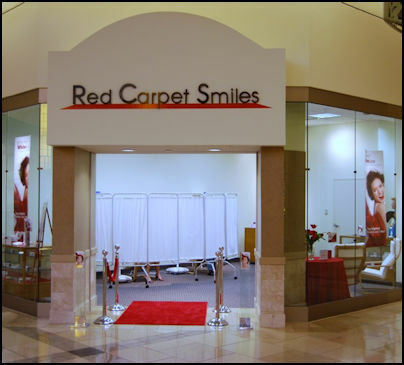 Red Carpet Smiles, Inc is a wholesale supplier of teeth whitening products to Dentists and professional teeth whitening operators. Our gels are manufactured in the U.S.A. and used by professionals worldwide. We are represented in Canada, the EU, Australia, and ship worldwide . Red Carpet Smiles, Inc also does private labeling for numerous other companies, but here you are buying direct from the source with no middle markup. Our gels are all natural, no parabens. Our gels are carefully crafted into a UNIQUE FORMULA of hydrogen peroxide and other natural ingredients at various strengths--depending on your needs. Gels are made at the time an order is placed, thus guaranteeing the FRESHEST PRODUCT POSSIBLE. We are a small company allowing us to provide individualized and EXCEPTIONAL CUSTOMER SERVICE. Without high overhead and elaborate packaging, we are able to offer the BEST PRICES you will find. We ship world wide but we do not pay any VAT or duty taxes, those are paid by the purchaser. Teeth Whitening gels come in three different formulas. *Hydrogen Peroxide - Best choice for chair-side treatments. *Non Peroxide - EU Regulations have created the demand for non-peroxide. All three teeth whitening formulas are available in a standard 3 ml syringe, 6 ml syringe, and 12 ml syringe. Each syringe comes with a tapered tip for exact placement, or the gels are available in a dial up applicator (click or brush pens), or pre-filled mouth trays. Hydrogen Peroxide is the most effective teeth whitening solution known. No other formula can match the effectiveness of hydrogen peroxide, the choice of professionals, and Dentists worldwide. Our USA made Hydrogen Peroxide formula can be produced in any percentage up to 40%. Normal percentages available online are 6%, 12%, 17.5%, 20%, 22%, 35% and our newest and most powerful 40%, but other percentages are available upon request. Please note: 35% and 40% Hydrogen Peroxide should not be used without a gingival barrier. Our Hydrogen Peroxide gel is made fresh when ordered, an important factor when using hydrogen peroxide. Our formula features GSE (grapefruit seed extract), an effective deterrent in periodontal disease and gingivitis. GSE is also an important antibacterial agent and gives us the advantage of providing a natural product with no parabens. Carbamide Peroxide must break down into hydrogen peroxide for it to oxidize stains. This break down requires more time to accomplish the same job as hydrogen peroxide and uses much of the chair-side treatment time. Unless there is no refrigeration capacity or the product needs to sit on a shelf until sold, (for instance in a drug store) it is not the best choice for chair-side treatments. Carbamide Peroxide is approximately 1/3 the strength of Hydrogen Peroxide. It comes in either 35% which is equivalent to 12% Hydrogen Peroxide, and 44% which is equivalent to 16% Hydrogen Peroxide. Non-Peroxide EU regulations have restrictions on the use of peroxides. Our Non Peroxide formula is sodium bicarbonate based. Sodium bicarbonate is a desirable formula and has been used for decades as toothpaste to clean and whiten teeth naturally. Our non-peroxide formula has a very pleasing taste and provides cavity protection and stain defense. Feel free to email us at RedCarpetSmiles@tx.rr.com. 15% restocking fee applies to non-defective returns, all gel products must be returned within 7 days of purchase to be eligible for any refund and must not have been opened.